Request Karie's music LIVE on PositiveMusicRadio! NOTE: Clicking on a CD cover or CD title link will take you to where you can purchase that CD. Shopping in our online book store is 100% safe. GUARANTEED. Search for CDs not listed in the book store by using the "Popular Music" link in the book store search engine at the bottom of the page. Bridge the Distance - Karie Hillery - Elements of Pop, Jazz, Country, Adult Contemporary, all finding their way on this creative body of work. Karie combines sweet sensibilities and experience for her songs - and brushes them all with her smooth alto voice. 14 tracks. Larry's Review: You'll love this beautiful work of musical art. Karie is a great artist who sings music straight from her heart. Transitions - Karie Hillery - Another brilliant work from this stunning composer/performer showing a beautiful and spiritual side to all the changes life has to offer, whether it is confronting truths about one's self or others, or coming to terms with the cards we are dealt, we all go through the same changes. 14 tracks. Larry's Review: This is my favorite of the three CDs. Excellent compositions and arrangements. I like "You Make It Beautiful." Karie makes beautiful music. 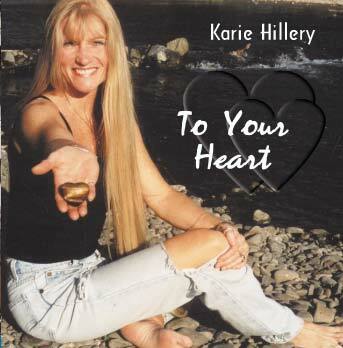 To Your Heart - Karie Hillery - "Lite-Pop, Smooth-Jazz" music that is spiritual and touching, and delivers an uplifting and heart-moving message. Features accomplished musicians and angelic harmonies guaranteed to open your heart. Larry's Review: Truly an inspirational artist on her way to the top. 13 smooth tracks that give pause for reflection. I love Karie's music. Click here to contact Karie Hillery!